This is the first film review on this website, and probably the last until another screenwriter manages to spin a story around Irish whiskey. Released in 1977, Poitín tells the story of a West of Ireland distiller of illicit poteen (as it's usually spelled in English), his local "distributors" and the two policemen charged with stopping him. The rocky landscape of Connemara doesn't support much in the way of agriculture, and there is no industry to occupy the local populace. We get the impression that the main character, Michil, runs his still as a way to kill time in this desolate place. Likewise, the police seem content to play their part of pursuing Michil, without ever quite catching him in the act. Besides, where would they get their hooch if they closed him down? It sounds like a tale of loveable rogues in a picturesque setting but it's far from that. The director, Bob Quinn, instructed his cameraman not to shoot any "pretty pictures" and even denied his actors makeup. Quinn had come from a documentary background and was very concerned with authenticity. Most of the parts are played by locals without previous acting experience. The language throughout is Irish, and Quinn felt that few professionals could manage the colloquial speech without sounding "actorly" or employing English rhythms. The three professional actors in the film - Cyril Cusack, Niall Tóibín and Dónal McCann - are some of the finest this country has ever produced, as well as being accomplished Irish speakers. Language is just one component of the soundtrack to this film. Quinn did not have the budget for expensive post-production so the ambient sound on location was carefully captured and augmented only slightly afterwards. Quinn's philosophy is that silence provides context for sound, in the same way that architecture is defined by empty space as much as by walls. So there are long silences that serve to accentuate the dialogue and sounds of nature. 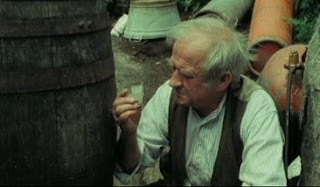 Quinn's musical collaborator, Roger Doyle, declined the offer to compose a score for Poitín saying that the soundtrack was beautiful enough without it. The film was therefore released without music in 1977. For the 30th anniversary re-release of Poitín, Bill Whelan (the composer of Riverdance), was invited to revisit this decision. He left much of the film's natural silence untouched but did underline some scenes with great subtlety. The new score is devoid of melody and contributes an unsettling effect that complements the story and its locale. The one melodic exception is a haunting song called Amhrán na Phoitín (The Poteen Song) sung by Cáitríona Ní Ceannabháin that we hear far off during the film and in full only at the end. If you buy the recent, digitally restored DVD release you will get both versions, with and without music, so you can decide for yourself which you prefer. So, what about the whiskey? 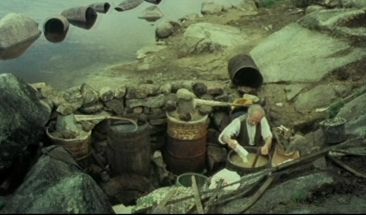 While bottles of poteen get plenty of screen time, we only see Michil making the stuff right at the very start. His raw material is barley, perhaps all malt, perhaps a mix of malted and unmalted grain. He helps along the fermentation by tipping in a few bags of sugar (not legally allowed in whiskey production in Ireland). We finally watch as he samples the product of distillation with satisfaction. There is no maturation stage. The colourless spirit is filled into bottles and sold for immediate consumption. Besides the sugar, this is another reason why we would not technically call poteen "whiskey". But it's undeniably the same base spirit, albeit less refined, and more likely to result in a sore head after drinking (or blindness, or death, if you believe the stories).